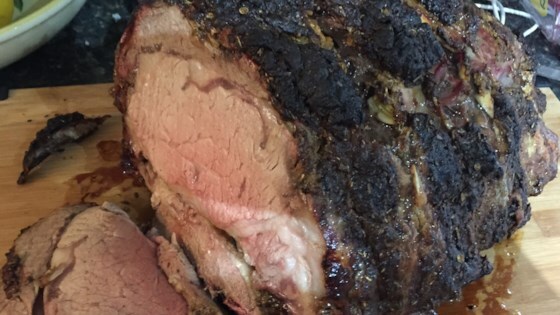 "This wonderfully easy prime rib will make you think twice about heading out to a restaurant." Bake in the preheated oven for 30 minutes. Reduce oven temperature to 350 degrees F (175 degrees C). Place a meat thermometer in the thickest part of the meat not touching the bone. Cook to your desired degree of doneness, or an internal temperature of at least 145 degrees F (65 degrees C) for medium, about 1 1/2 hours. Remove from the oven, cover with a doubled sheet of aluminum foil, and allow to rest in a warm area 10 to 15 minutes before slicing. I used this recipe for a New York roast. It was easy and my husband really loved it. I definately will use this again. Simple and easy to make. Favors were superb - came out very tender. If not a Rosemary lover - just go a bit lighter : we used only one sprig and flavor was stupendous!!!! Highly recommended!!! Made this for my family. Perfectly roasted medium rare. A keeper. My prime rib was boned and great! I will make this again without any changes to the recipe. Everyone loved it! I did age the beef in the frig for a few days.